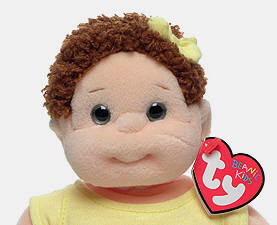 Ty Beanie Kids were announced on January 8, 2000, at gift shows in Atlanta, Philadelphia and Dallas. 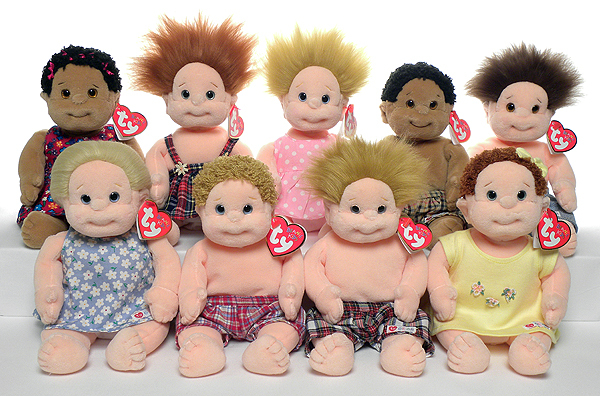 Ty's first family of dolls started with nine Kids: Angel, Boomer, Chipper, Curly, Cutie, Ginger, Precious, Rascal and Tumbles. On February 11, 2000, the Ty website posted information and images on the new line. 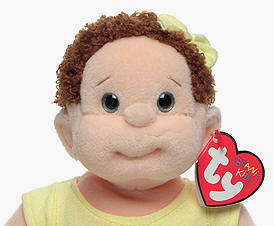 Ty's Beanie Kids have soft bodies and curly or unruly straight hair that can be combed and styled. They also feature other details like dimples, belly buttons and hand-painted crystal eyes. Each Beanie Kid has its own name, birthday and phrase. On July 8, 2000, Ty introduced (at the Atlanta Gift Show) coordinated clothing outfits for the Beanie Kids. The clothing outfits were a new product category called Ty Gear. The Ty Gear line expanded into a total of 26 different outfits and three carrying cases. There was also a small backpack that could be used by children to carry around their Beanie Kids; available from the Ty online store. The five girls in the first release of Beanie Kids had underpants with Velcro fasteners in the back. In May 2000, the Velcro fasteners were replaced with elastic waistbands. Girls with the Velcro underpants can have either the first or second variation of the swing tags. In late May 2000, at the same time the third variation of the Beanie Kids swing tag appeared, the face design of the Kids also changed. The distance from the hairline to the top of the nose decreased approximately .25 inches. Note the difference between the first and second versions of Curly (below). The second version also had rounder and rosier cheeks to minimize the appearance of stitching below the eyes. During the short 2-year run of the Beanie Kids, 24 of them were born. The last one, BABE-e 2003 (only available from the Ty online store) retired on January 29, 2003. 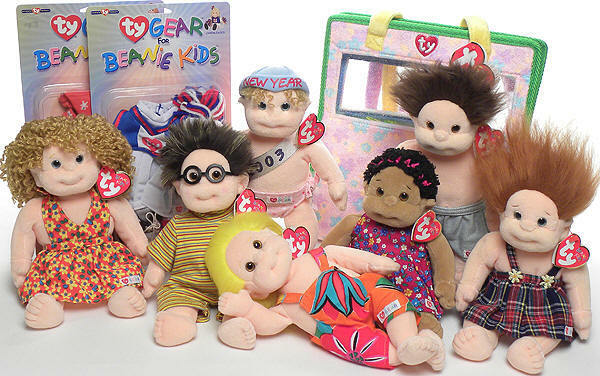 All of the other Beanie Kids were already retired when BABE-e 2003 was introduced on January 1, 2003.